Fraud detection and prevention are the solutions which are provided by various IT firms in order to detect the fraud related activities. It is an analytical solutions that analyses the pattern of the frauds. It authenticates and verifies the user for prevention of fraud related activities. Thus, it prevents unauthorized access to the data and maintains data integrity. It provides controlled environment for sharing of information, strategic consulting and fraud risk assessment in order to detect specific problems. It provides effective enterprise solution for better management of frauds, threats and cyber-attacks in order to increase the operational efficiency. The market can be segmented on the basis of service, solution, application, enterprise, end-use industry. On the basis of service, it is sub-segmented into professional service and managed service. The professional services is the largest sub-segment during the forecast period. The growth in sub-segment can be attributed to rising number of fraudulent activities coupled with stringent government norms in order to protect the important data. On the basis of solution, it is sub-segmented into money laundering, insurance claims, electronic payment and others. On the basis of application, it is sub-segmented into small & medium enterprises and large enterprises. The emerging small and medium scale sectors in various developing countries across the globe lead to high adoption of fraud detection and prevention solutions. On the basis of end-use industry, it is sub-segmented into telecommunication, BFSI, retail, healthcare, government/public sector, energy and power, real estate, manufacturing and others. BFSI is the largest sub-segment for the end-user segment. It is expected to generate highest revenue during the forecast period. The high adoption of fraud detection and prevention solution by BFSI sector coupled with the increasing demand for enhancing the authentication process is expected to be major factor for the growth of sub-segment. The increasing number of online transactions across the globe on the account of developing e-banking and e-commerce industries across the globe. Thus, it is major driver for the growth of overall fraud detection and prevention market during forecast period. Additionally, the growing number of payment gateways such as PayPal, Apple pay, and Google wallet is also expected to fuel the overall market during forecast period. The increasing demand from various end-uses to prevent the loss of important data and documents is expected to be the major driver for the growth of overall market during the forecast. 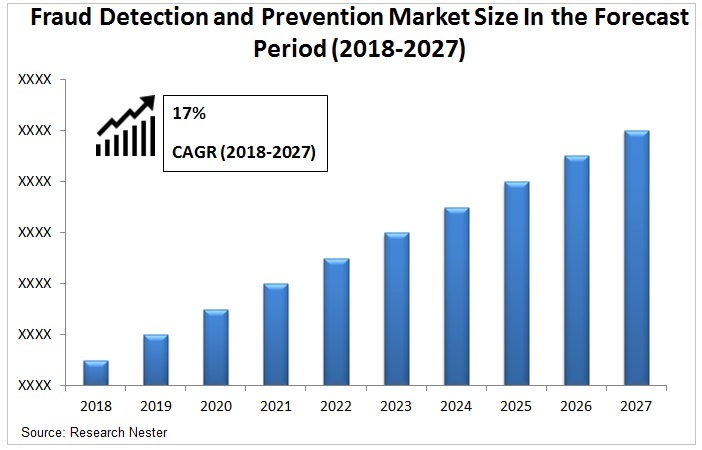 The high adoption of solutions on the account of rising demand for improving profitability is also expected to support the market growth of the fraud detection and prevention market across the globe. The high cost associated with the deployment of software is expected to hinder the growth of overall market during the forecast period. The non-availability of certain measure associated with fraud detection and prevention is also another factor expected to hinder the growth of overall market during the forecast period. On the basis of regional analysis, global fraud detection and prevention market is segmented into five major regions including North America, Europe, Asia Pacific, Latin America and Middle East & Africa region. North America is the leading region of the overall fraud detection and prevention market during the forecast period. The high adoption of internet based services in the region on the account of high penetration of internet is anticipated to propel the growth of overall market during the forecast period. Asia-Pacific region is the fastest growing region for the overall market and is expected to register highest CAGR during the forecast period. The growing expansion of various end-use industries in the region coupled with increasing number of fraud cases is expected to support the overall market in the region during forecast period. For instance, according to India Brand Equity Foundation the market size of retail sector in India was USD 641 billion in 2016 and increased to USD 672 billion in 2017.The growing expansion of retail sector in India is expected to increase the demand for fraud detection and prevention which in turn is expected to boost the growth of overall market during the forecast period.